There are different assessment types teachers use to inform and guide their instruction, of particular important to us in today’s post is the one called formative assessment. Unlike pre-assessment (usually conducted before a lesson) and summative assessment (done at the end of a lesson or lesson unit), formative assessment is an ongoing form of assessment that takes place during students learning. In their book ‘Literacy 2.0: Reading and Writing in 21st Century Classrooms’, Nancy Frey and Douglas Fisher differentiated between assessment of learning (summative assessment) and assessment for learning (formative assessment). The purpose of formative assessment is to check students understanding during the learning process. Based on insights collected through formative assessment, teachers get to adjust their instructional strategies to attend to students’ emerging learning needs better plan for future teaching/learning opportunities. There are several ways to carry on formative assessment in your class. You can use quizzes, interactive games, polls, backchanneling, interactive videos, observations, graphic organizers, peer/self assessment, exit slips and many more. In today’s post we are sharing with you some of the best web tools to use to formatively assess your students. 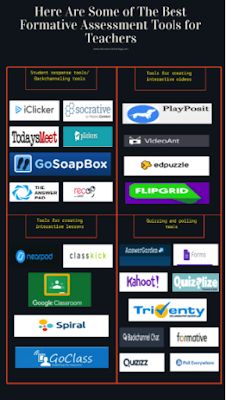 These tools, curated from different sources (see reference list at the end of the post), are easy and simple to use and you can seamlessly incorporate them in your classroom instruction. For organizational purposes, we arranged these tools into four generic categories: student response and backchanneling tools, tools for creating interactive videos, tools for creating interactive lessons, and quizzing and polling tools . Some of the tools can comfortably fit in different categories: Check them out below and share with us your feedback in our Facebook page. There is an infographic version of this post which you can access here. This combines the functionalities of two tools: a powerful student response tool to use with students for formative assessment and a self-grading app to help you with your quizzes. Enrich your videos with a wide variety of question types and monitor students performance in real time. Add your own voice and questions to create interactive videos and track your students comprehension. This is a responsive video annotation tool that lets you easily add annotations and comments to web-hosted videos. Create a Grid for your class, pose questions and get students engaged in discussion using short video responses. Create a lesson, add interactive content such as quizzes, polls, open-ended questions, videos, and share a live session with students during which you can receive comprehensive student assessments individually or as a class. Create and distribute assignments then provide real-time and direct feedback to students. Transform your class into an interactive learning space where you can create quick formative assessments, interactive presentations, turn public videos into live chat with questions and quizzes. Create interactive lessons using images, videos, texts, links and provide students feedback through notes and media annotation. Lets you ‘quickly assess students with prepared activities or on-the-fly questions to get immediate insight into student understanding’. Create personalized assignments through the use of images, videos, links, and drawings. Students provide their feedback in 1:1 or in small groups. Using generated reports, you can see who needs help and how they are performing throughout the assignment. Create engaging quizzes or use quizzes designed by others to formatively assess students learning. Quizizz provides you with detailed class and student-level reports to help you with the assessment of students learning needs. Lets you build assignments and get live responses and feedback from students. Select a pre-designed assessment or create your own from scratch and get instant insights on how your students are performing. No marking, scores are calculated automatically. Another helpful tool for creating class quizzes. Create a quiz, share it with students using a generated link, students access the quiz from their devices, no app installation required. Lets you create fun and engaging learning games using a variety of questions and multimedia content. 60 Formative Assessment Strategies by Natalie Regier, M. Ed.